Writing science books for kids, or books for kids that have real science, is a tightrope walk balancing precariously between accuracy and engagement. The Squid, the Vibrio & the Moon is all about the lifelong partnership between the Hawaiian Bobtail squid and the bioluminescent bacteria, Vibrio fischeri. Yes, it’s a book that focuses on bacteria. The science here is really interesting: Personally, I had no idea about the relationship between squid and bacteria. I also didn’t know the scientific names for many of the characters and parts covered in the books. I learnt a lot reading this book. The only problem may be that I’m not the target audience. The Squid, the Vibrio & the Moon is beautifully illustrated and makes clever use of the ebook format to get some motion into the pages. The iBook version I looked at had great backing music and an engaging reading voice – although this is really the sort of book someone ought to be reading to a child, not leaving that job to a computer. The science is presented clearly enough to be engaging and comprehensible; it is also layered enough to be both taken at face value and provide hooks for further exploration. The ‘science behind the story’ scientific explanation at the end of the book is simply brilliant stuff. The writing is clear and, amazingly, the authors do a good job of making bacteria into characters. My only concern is whether the tightrope walk leans a bit too far towards the science to be really engaging for kids of the age this book is aimed at. This is pitched as a story-book – the bacteria and the squid have names and are anthropomorphised. With an engaged parent or teacher reading the book to a child it’ll work perfectly: But it’s not the sort of book you’d be likely to do well with if you’re reading on auto-pilot after a tough day at work. It would also work well for a slightly older child who’s into the science but not yet old enough to be put off by the format, rather than the content, being too childish. In a school environment this work would be fabulous. To put this in some perspective: My highly scientific 12-year-old Junior-Senior Science Correspondent was completely captivated by the information in the book. 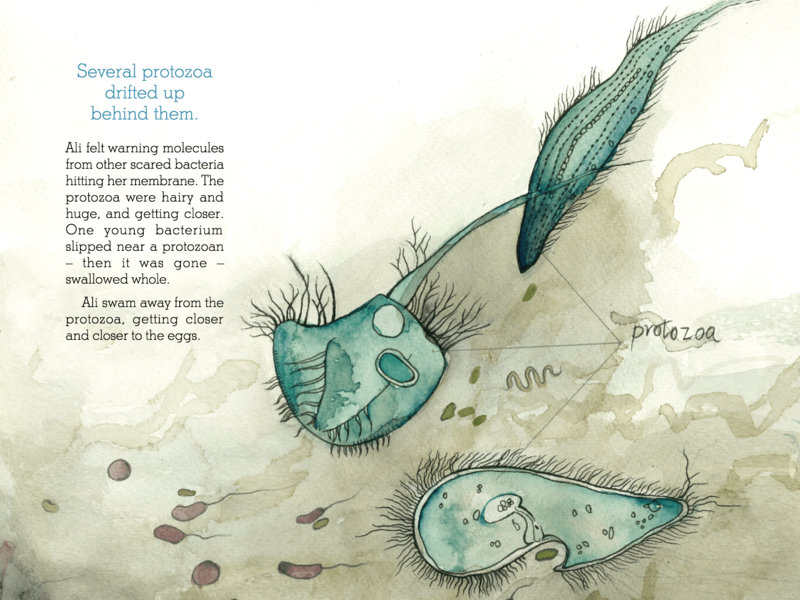 The Squid, the Vibrio & the Moon is the first in a series of books created by Dr Gregory Crocetti. After working as a microbial ecologist in laboratories in Brisbane and Sydney for over a decade, he became despondent with the war we wage against so many of the microbes in the world around us, and decided to find a way to help people empathise with bacteria, protozoa, etc by telling stories about them. And so rather than focus on the handful of disease-causing microbes, the ‘Small Friends’ stories focus on some of the more cooperative symbiotic relationships between microorganisms and larger forms of life. I loved this book and learnt a lot from it. Even without a child of the suitable age to read it to I’d be likely to buy further books in the series just because they are clever and beautiful. The Squid, the Vibrio & the Moon is available through GooglePlayBooks and the iBookstore. At around $4 it’s fantastic value. We read a review copy of The Squid, the Vibrio & the Moon generously provided by the authors.